Accident Investigation Bureau (AIB) on Wednesday released preliminary report on the helicopter crash involving Vice President Yemi Osinbajo in Kabba, Kogi state penultimate Saturday. The Agusta Westland 139 chopper with the registration number 5N-CML and managed by Caverton Helicopter had crash-landed in Kogi State stadium at about 3:00pm. 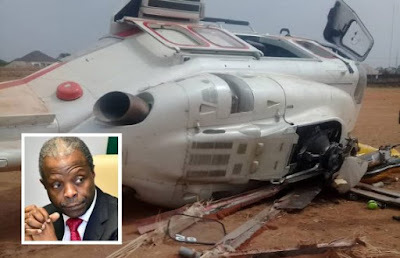 The chopper had on board Osinbajo and 11 others including the crew members. AIB, the agency responsible for accident investigation in the aviation sector, had taken up the probe of the crash under the civil aviation (air accident) regulations 2016. Releasing the preliminary report today, AIB Commissioner/Chief Executive Officer (CEO), Engr. Akin Olateru said while investigation is still ongoing, preliminary findings indicated that the crew lost visual contact with the ground. He however said the prevailing weather condition was good at the time of the flight contrary to the statement by Caverton that the crash was due to bad weather, adding that the Helicopter experienced a hard landing owing to what he called brownout. Brownout is a condition generated during landing in a dry and sandy environment. He said the operator of the Helicopter failed to carry out safety risk assessment of the landing area as well as the site survey prior to the dispatch of the aircraft from Abuja. Two safety recommendations were issued including that the NCAA should issue an advisory circular to all helicopter operators to be alert of the possibility of brownout while Caverton Helicopters was charged to operate in accordance with its approved flights operation manual while carrying out risk assessment. He said the final report would be released in few months.